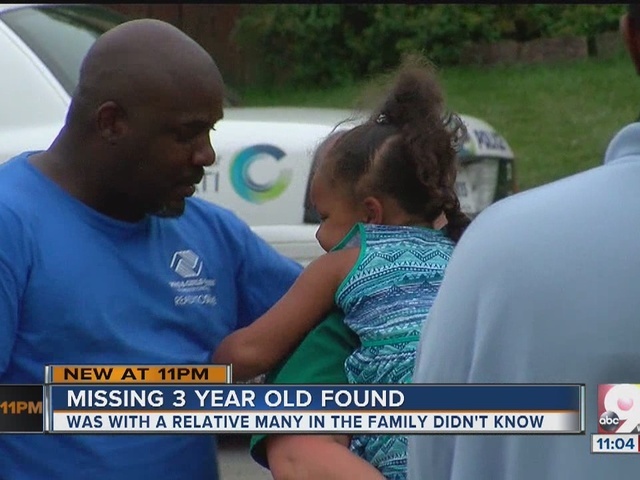 CINCINNATI -- Cincinnati police have found a 3-year-old girl missing for several hours on the city's West Side. Angel Smith was missing from Bighorn Court in Westwood, near Montana Avenue, Lt. Steve Saunders said. Saunders later confirmed the girl had been found. WATCH the video above for Angel's heartwarming reunion with her family. Police searched for her from about 4-7:30 p.m. Monday. There were several police officers on Bighorn Court on Monday evening. Saunders said it was a case of miscommunication between either a family member or a family friend. No charges will be filed. "I thank the lord above that someone was taking care of her," said Angel's father, Antonio Smith.